There are two streams running in parallel. You can move between them and pick and choose sessions in each. Nicole Alexander writes sweeping epics evoking the grandeur of Australian landscapes, the hardships of rural life, and the turmoil of historic events. Ella Carey introduces her readers to the quiet interconnections through parallel narratives of women living in modern and past times. Both authors draw on the personal to weave tales into a wider historical context. Irina Dunn asks these authors about their writing journeys, the inspiration for their books, and why they draw upon family legend. The frontier wars, Acts of Protection and Assimilation, and kidnapping of the Stolen Generations are episodes in Australian history which have been erased or minimised. Many Australians still remain ignorant while ‘official’ white accounts taught in our schools have yet to fully address such events. 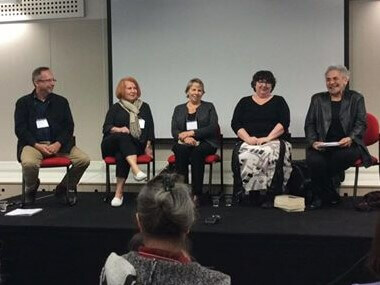 Author Marie Munkara and researcher Katrina Schlunke discuss with Tom Moody why Aboriginal history has been suppressed, what is needed to remedy the omission, and how historical fiction can play a role in ensuring past injustices and cruelties aren’t forgotten or repeated. Join us for a cuppa, browse the bookshop, and get your copy of your new purchase signed by the author. The allure of France has often inspired historical novelists to conjure the romance and tumult of its history. Kate Forsyth’s latest novel, The Blue Rose, transports the reader to the perils of the French Revolution and the exotic world of Imperial China. Natasha Lester’s The French Photographer deals with more recent history of World War II France and America. Hear Jackie Ballantyne discuss why Kate and Natasha were drawn to set their books in France, and how they discovered new stories to tell about a country that continues to fascinate. The Regency period lasted a mere nine years while Prince Regent George ruled as his temporarily mad father’s proxy. The glamour and charm of the era has lasted far longer with a plethora of novels set in in those times first made popular by Georgette Heyer in the 1920s. Alison Goodman, Anne Gracie and Anna Campbell chat with Elizabeth Jane Corbett about their inspirational sources, their own passion for the period, and how they have played with the tradition of Regency romance. Join us for lunch, browse the bookshop, and get your copy of your new purchase signed by the author. Stark Australian landscapes are both menacing and beautiful in Jock Serong’s Preservation and Rachel Leary’s Bridget Crack with protagonists who must overcome physical and psychological threats. Stephanie Parkyn’s Into the World forces her heroine to face ocean hazards while striving to protect a dangerous personal secret. Lisa Chaplin explores these authors’ sources of inspiration, and what it takes to create characters who battle internal fears in a fight for survival against nature. Parramatta, our home for the weekend, was the second penal settlement established in Australia. When Thomas and Meg Keneally decided to set their Monsarratt detective series there, Meg sought the assistance of local historian, Gay Hendrikson, to dig into the township’s history. Gillian Polack learns how Meg and Gay formed a working relationship to trace the footsteps of the Keneallys’ characters, locate potential murder sites, and pore over history together, and how their collaboration extended to Meg’s first solo novel Fled. Historical novelists often employ wise women, dark magic and the pharmacopoeia of humble plants to keep readers spellbound. Join Kate Forsyth, Kim Wilkins and Elisabeth Storrs as they share some of the more bizarre examples of superstition, folk lore and enchantments, interwoven with the ‘bubble, bubble, toil and trouble’ of their plot-lines. We’ll see you again next time! Writing historical crime fiction is like a treasure hunt for authors who dig up nuggets from the past to recreate old crimes and mysteries, both real and imaginary. How do authors lay down clues to keep readers (and the central characters) guessing whodunit? How do you balance the interlacing stories of detective, murderer and victim? What sources do authors use to set the scene and solve the crime using old-fashioned methods of crime detection? Felicity Pulman tracks down the answers to these questions and more with Robert Gott, Katherine Kovacic and Tessa Lunney. What are the challenges faced in researching pre-history when there are no written records? How do you approach interpreting Middle Age chronicles? Or choose between a plethora of conflicting primary sources when delving into modern history? Isolde Martyn investigates the research challenges faced by Ilka Tampke, Gillian Polack and Pamela Hart when they tried to find answers that may or may not be known. Parallel narratives with interlocking stories crossing different eras have been used to great effect in historical novels. What plot devices do authors use to trace the connections between their characters? Do writers use the same techniques as in historical mysteries? And how do they balance the competing voices that must be heard in order for revelation to be achieved? Tea Cooper, Emily Madden, Carla Caruso discuss with Diane Murray the challenges of intertwining lives around historical eras. When starting to write, deciding which type of point of view will be exploited is a significant decision with far-reaching consequences. Who knows what? Who sees what? How much do you want the reader to know? And when? Once the decisions are made, they can be both liberating and confining. Greg Johnston will explore ‘the slings and arrows’ of point of view with Robyn Cadwallader, Julian Leatherdale and Belinda Castles. Ensuring a female protagonist’s thoughts and actions remain true to the norms of by-gone eras and cultures causes headaches for writers – and readers. How does an author maintain immediacy if limited to second hand observations of male dominated history? Should women of the past be depicted with more power and influence than would have been afforded to them? And how do you treat a young heroine in an age where girls were restricted, and children expected to be ‘seen and not heard’? Sophie Masson will examine how to portray plausible female protagonists with Lauren Chater, Elizabeth Jane Corbett and Kirsty Murray. More and more historical novels are being adapted for screen with lavish production values and high profile stars. What is the secret to writing scripts compared to books? How do scriptwriters condense intricate plots into a few hours screen time while maintaining complexity of characters and themes? What elements are producers searching for when considering a story? And are compromises needed when wooing an audience compared to a readership? Luke Devenish and Mira Robertson discuss with Jesse Blackadder the different approaches required when writing novels, adaptations and screenplays.